Each year over one million Americans will have a heart attack. Approximately every minute (>400,000/year), someone will die of one 1. Symptoms are an unreliable prompt for getting patients to the hospital in the case of a heart attack. Despite decades of public campaigns, many patients still fail to recognize the symptoms of a heart attack and do not go to the hospital. Often patients go only after considerable and unnecessary delay. Further, many patients unnecessarily go to the hospital because they incorrectly think they are having a heart attack. The average time from symptom onset of an acute coronary syndrome (ACS) event to hospital arrival has remained at over 3 hours, even for people who have suffered a prior heart attack. The largest contributor to this delay is the time interval between symptom onset and the decision to seek medical treatment. This unnecessary delay is due to factors such as patient misconceptions about symptoms, denial and anxiety. Many patients expect to experience the obvious symptoms such as crushing chest pain. They do not know that ACS events often produce only mild chest pain, discomfort, or other symptoms such as shortness of breath or diaphoresis. Up to 30% of patients may experience no symptoms at all and have “silent ischemic” events, with factors such as diabetes, age, and gender increasing the risk of only having more subtle symptoms. If patients accurately sought treatment during the first hour following symptom onset, better outcomes could occur. What is needed is a technology that can provide clear warning to patients with better accuracy than symptoms. Identifying ACS events early and treating them promptly significantly improves clinical outcomes. Experimental and clinical studies have shown that most irreversible myocardial damage occurs during the first two hours after coronary occlusion. Milavetz et al.2 demonstrated that successful reperfusion therapy within two hours results in the greatest degree of myocardial salvage. According to Boersma, et al.,3 restoration of flow, regardless of the method used, can abort infarction within the first 30 minutes after coronary occlusion, and the benefit of fibrinolytic therapy compared with placebo is considerably higher in patients treated within 2 hours after symptom onset than in those treated later. Further, evidence advises that the rapid restoration of blood flow after the onset of symptoms in patients with the most severe type of MI, ST elevation MI (STEMI), is a key determinant of short and long-term outcomes. Therefore, early identification and arrival at the hospital for a prompt diagnosis and treatment is paramount to improve the outcomes of ACS events. While it is possible to monitor ECGs and detect an acute infarction, currently available systems have limitations in the home environment. · Twelve-lead ECG systems require a clinically trained individual to place the leads and interpret results. · Holter monitors are designed to only provide only a few days or weeks of monitoring. · Surface electrodes are subject to “noise” from patient movement and body orientation. · Contemporary implantable cardiac monitors do not have sophisticated sensing and evaluation algorithms necessary to reliably detect ischemia. 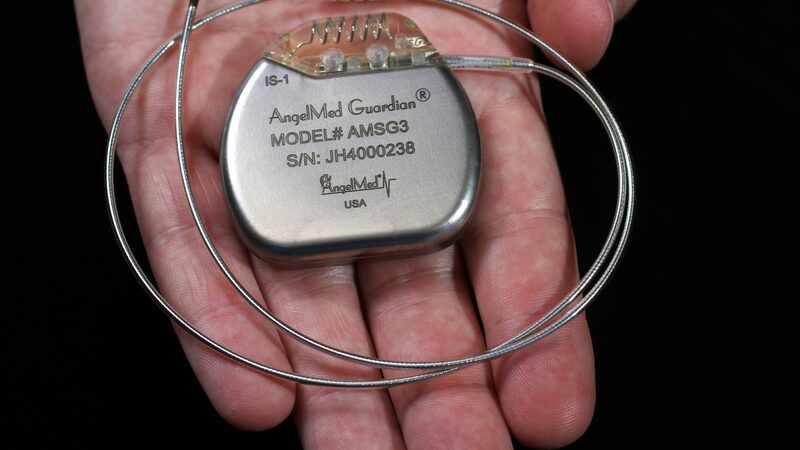 Only the AngelMed Guardian system is specifically designed to measure the ST segment changes of a person’s heartbeat in real time electrogram data, 24/7, and alert the patient to seek medical attention when it detects the changes that are statistically abnormal for the patient. Because the cardiac monitor is implanted, it provides continuous coverage, is less vulnerable to patient non-compliance, and is not susceptible to the noise and other artifacts encountered by external devices. Go AS, Mozaffarian D, Roger VL, Benjamin EJ, Berry JD, Borden WB, Bravata DM, Dai S, Ford ES, Fox CS, Franco S, Fullerton HJ, Gillespie C, Hailpern SM, Heit JA, Howard VJ, Huffman MD, Kissela BM, Kittner SJ, Lackland DT, Lichtman JH, Lisabeth LD, Magid D, Marcus GM, Marelli A, Matchar DB, McGuire DK, Mohler ER, Moy CS, Mussolino ME, Nichol G, Paynter NP, Schreiner PJ, Sorlie PD, Stein J, Turan TN, Virani SS, Wong ND, Woo D, Turner MB; American Heart Association Statistics Committee and Stroke Statistics Subcommittee. Heart disease and stroke statistics–2013 update: a report from the American Heart Association. Circulation. 2013 Jan 1;127(1):e6-e245. Boersma E, Maas AC, Deckers JW, Simoons ML. Early thrombolytic treatment in acute myocardial infarction: reappraisal of the golden hour. Lancet 1996;348:771-5. Milavetz JJ, Giebel DW, Christian TF, Schwartz RS, Holmes DR Jr, Gibbons RJ. Time to therapy and salvage in myocardial infarction. J Am Coll Cardiol. 1998 May;31(6):1246-51.